The Optio X certainly has a unique appearance with a twistable body and the slimmest in the Optio series. 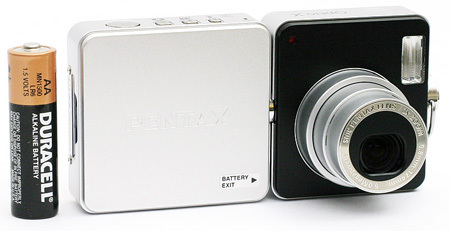 With a stylish black and silver body, the Optio X is one of Pentax's latest feature-packed 5 megapixel digicams. The Optio X features a 3x optical zoom lens and 15 different recording modes as well as movie and voice memo functionality. In addition, the camera offers advanced functions such as manual white balance and 5 different bracketing options. In our review of this camera, we discovered several strengths and weaknesses. For starters, it isn't the fastest camera available, but in most cases it puts in a decent performance. For example, it has respectable startup and write speeds. Unfortunately, the auto focus can be somewhat slow. In our test, the camera took nearly a full second to focus and take a picture. With respect to image quality, the Optio X generally does a good job taking even exposures with accurate color. However, we found clipped shadows and highlights in some of our samples in addition to jaggies along diagonal lines. Read on for more details of the ultra-thin Optio X. #4 Look at the Canon S410. Great image quality, small size, li-ion recharageable batt, CF cards, durable, and good software to boot. "However, considering all the downfalls and a price tag of $300+, it might be a better idea to consider other cameras." Why buy a high MP camera if image quality is poor?